Inspirational, innovative and family friendly. Ventura is possibly now my favourite ship in the fleet. So much choice of things to do, so many choices of venue and the dining options are fantastic. She has one of the largest children and teens area on any ship, so there is always plenty to keep the little ones entertained too. Cosmopolitan, refined and family friendly. I will always love Aurora. Her stylish elegant lounges and bars provide the perfect setting for both formal and semi formal evenings. Recently refurbished Marco Pierre White inspired Café Bordeaux and the Pennant Grill are among my favourite dining places at sea. The covered pool and great childrens facilities makes this ship a winner with families. Oriana is indeed a very elegant ship and was the first superliner built for the British public for many years. Launched in April 1995. She wowed me then and still wow’s me now. Now an adults only ship and recently refurbished she is looking very fresh and stylish. Her stunning atrium will blow you away as soon as you board this ship. A great ship for those who have never cruised before as she offers a more informal feel, but still offers all the glitz and glamour that you would expect from a P&O ship. A popular choice for families, again with great facilities including a sports court in the funnel. Arcadia has just come out of refit. Have you seen the photos of her new aft section being lowered into place? I can’t wait to get back onboard Arcadia, check out the new boutique cinema and the new Aquarius Bar with it’s additional new seating area. Arcadia has possibly my favourite spa area at sea with hydrotherapy pool and hot stone beds that look out to sea. Adonia provides an extensive range of on board facilities, yet carrying just 710 passengers is small enough to be able to reach off the beaten track ports of call. Exclusively for adults, Adonia will offer an atmosphere that is intimate and refined – and the on board excellence for which the company is renowned.Traditional, Intimate and child-free. 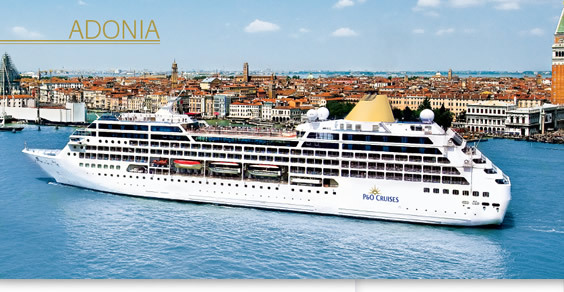 Azura is the newest ship in the P&O fleet. Azura entered service in April 2010, built exclusively for Britain. The spectacular celebrity naming ceremony, with Darcey Bussell CBE as the ship’s Godmother, took place on Saturday April 10, 2010. Azura is a sophisticated and glamorous sister to the other ships in the fleet and offers a more traditional onboard cruise experience. At the heart of Azura is her atrium, a very social venue located over 3 magnificent decks, with a cafe, art gallery, bookshop, library and shopping. In the evenings you can dance the night away on the beautifully polished dance floor. The music and dance continues in the Playhouse Theatre with West End style shows and in Manhattan, Azura’s New York inspired show lounge. The Retreat is an alfresco terrace designed exclusively for adults, offering treatments under airy cabanas & beneath moonlit skies, On deck there is an open air cinema screening British Film favourites and Hollywood blockbusters. Azura boasts 4 pools and 6 whirlpool spas, a gymnasium, an Oasis Spa & Health Club plus plenty of restaurants, a pub and Casino! Dining Highlights: Michelin Star Chef Atul Kochhar’s Seventeen and The Glass house, a wine bar and restaurant created in partnership with TV’s Olly Smith.